If you are an Amazon seller then you will be aware of the pain of marking an item on Amazon as despatched and printing off the invoice. We have extended our software tool JustShipIT to be compatible with Amazon to speed up your processing and save you time. JustShipIT is a tool for both eBay and Amazon sellers to download all their orders and customer details to one single application allowing the printing of customisable invoices and labels with speed. Once the orders have been printed JustShipIT can update the paid and dispatched status allowing you to concentrate on getting your parcels wrapped and delivered in plenty of time. Please see how to setup Amazon store for full details on how the Amazon token is linked during the setup, this allows us to integrate to Amazon to download your orders and store them into our application ready for the fast printing of the labels and invoices. 1. Download Orders Just Ship IT enables you to download all your unshipped Amazon orders instantly instead of having to print each invoice one at a time, it does this by linking your account on Amazon and then when JustShipIT is started up, you may click on the Download Now button. This starts the process of downloading your sold items and orders from Amazon. To retrieve your available Amazon orders please click the Download Now button 2. Print Labels and Invoices Please take a look at our Just Ship IT tour and Help pages to know more about setting up your label template and invoices before printing with Just Ship IT, there is a full help guide to get you started in the customisation of your invoices and labels, ready to for the fast performance of the bulk printing within the software. 3. Confirm the Shipments To confirm the Amazon orders have been shipped with JustShipIT the user must provide amazon with the delivery service, this allows JustShipIT to automatically despatch the sold Amazon items. This can be done either per Inventory item or in Bulk depending on your requirements. 4. Changing the preferred shipping service with Amazon To change the delivery service or add additional tracking information use the fields in the form above before clicking the confirmation button. 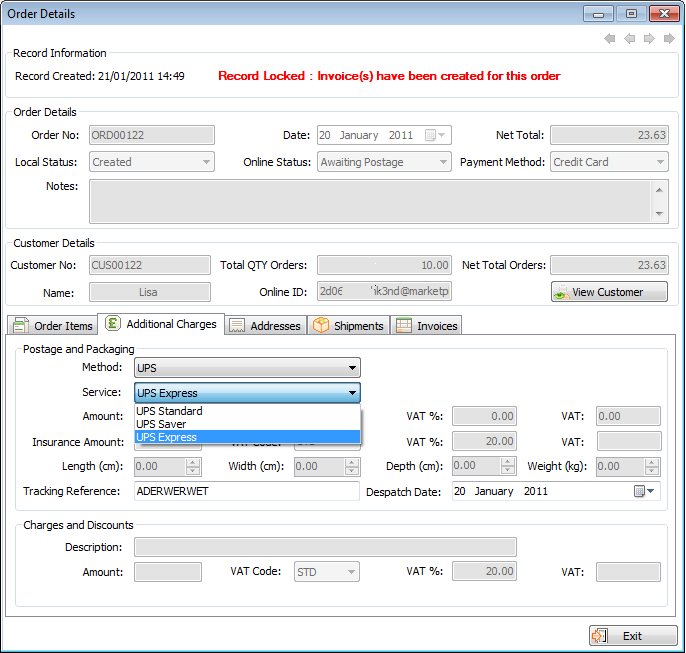 You should edit the Additional Charges of your order if required. This screen is also useful if one particular customer asks to upgrade the delivery service. 5. Updating the status of your Amazon orders When you are ready to confirm your orders you need to change the online status to Paid and Dispatched and click the Download Now button to re-send the data back to Amazon and then your orders are complete. If you have any comments or feedback you may contact us by using the phone number above or via the live chat service for which we are available within and outside of normal working hours.